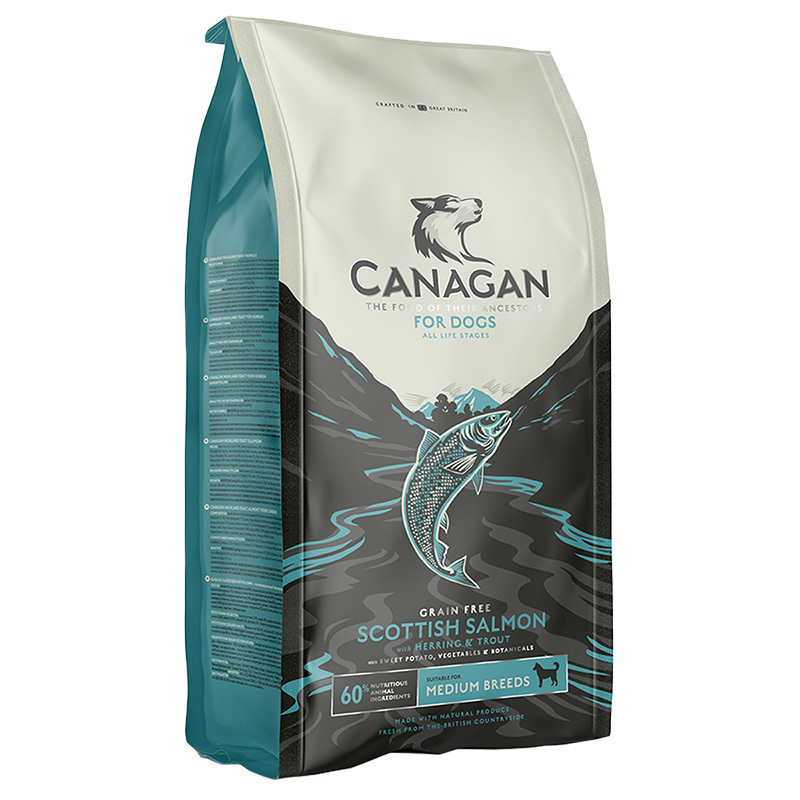 Contains Scottish Salmon, Herring & Trout suitable for dogs & puppies. With 60% nutritious animal ingredients and 40% vegetables, botanicals, vitamins & minerals, Canagan is a totally grain-free premium quality dog food, which contains an array of high quality selected fish - produced to an equivalent human food standard. Canagan includes a host of botanicals with a wide range of therapeutic properties. Freshly prepared deboned Scottish Salmon (26%), Sweet Potato, Dried Scottish Salmon (10%), Dried Herring (8%), Peas, Potato, Dried White Fish (5.5%), Salmon Oil (5%), freshly prepared Trout (4%), Alfalfa, Sunflower Oil, Salmon Gravy (1.5%), Pea Protein, Minerals, Vitamins, Apple, Carrot, Spinach, Seaweed, Fructooligosaccharides, Psyllium, Camomile, Peppermint, Marigold, Cranberry, Aniseed & Fenugreek. For puppies - Canagan can be introduced at weaning, mashed down with water between 5 and 6 weeks slowly move them onto dry kibble. Canagan has recently been reviewed in Which Magazine and scored 4.6 out of 5! Canagan is set to become the next big thing in the UK. It combines a high meat content and excellent ingredients with great packaging and the all important 'made in Britain' logo. Based on a dog weight of 40-50kg the approximate feeding amount was 398 grams per day. Approximate feeding cost: £1.79 per day - in terms of cost, a bag of Canagan does not come cheap but since the daily feeding amounts are low, the price per day works out fairly well. Conclusion: A great British food. Excellent natural ingrediens including plent of top-quality meat and no cereals.